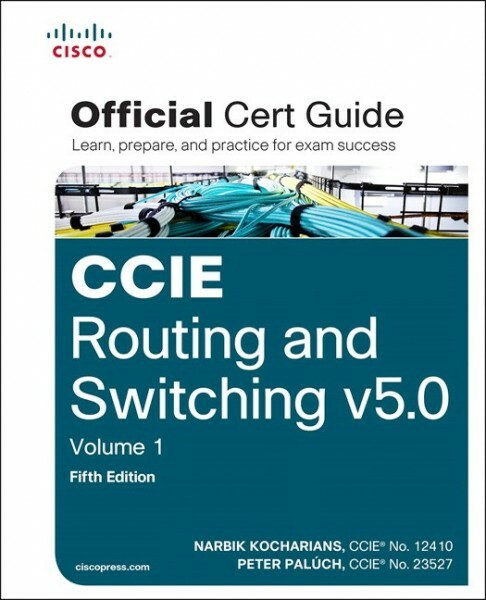 CCIE Routing and Switching v5.0 Official Cert Guide, Volume 1, Fifth Edition from CiscoPress enables you to succeed on the exam the first time and is the only self-study resource approved by Cisco. Expert instructors Narbik Kocharians and Peter Palúch share preparation hints and test-taking tips, helping you identify areas of weakness and improve both your conceptual knowledge and hands-on skills. This first of two volumes covers LAN switching, IP networking, and IP IGP routing topics. questions and exercises, this official study guide helps you master the concepts and techniques that ensure your exam success. CCIE Routing and Switching v5.0 Official Cert Guide, Volume 1, Fifth Edition is part of a recommended learning path from Cisco that includes simulation and hands-on training from authorized Cisco Learning Partners and self-study products from Cisco Press. To find out more about instructor-led training, e-learning, and hands-on instruction offered by authorized Cisco Learning Partners worldwide, please visit www.cisco.com/go/authorizedtraining.